Home / Technical Articles / What Size Wind Turbine Do I Need? The size of the wind turbine you need depends on your application. Small turbines range in size from 20 watts to 100 kilowatts. The smaller or “micro” (20–500-watt) turbines are used in a variety of applications such as charging batteries for recreational vehicles and sailboats. One- to 10-kW turbines can be used in applications such as pumping water. Wind energy has been used for centuries to pump water and grind grain. Although mechanical windmills still provide a sensible, low-cost option for pumping water in low-wind areas, farmers and ranchers are finding that wind-electric pumping is a little more versatile and they can pump twice the volume for the same initial investment. In addition, mechanical windmills must be placed directly above the well, which may not take the best advantage of available wind resources. Wind-electric pumping systems can be placed where the wind resource is the best and connected to the pump motor with an electric cable. Turbines used in residential applications can range in size from 400 watts to 100 kW (100 kW for very large loads), depending on the amount of electricity you want to generate. For residential applications, you should establish an energy budget to help define the size of turbine you will need. Because energy efficiency is usually less expensive than energy production, making your house more energy efficient first will probably be more cost effective and will reduce the size of the wind turbine you need. Wind turbine manufacturers can help you size your system based on your electricity needs and the specifics of local wind patterns. A typical home uses approximately 9400 kilowatt-hours (kWh) of electricity per year (about 780 kWh per month). Depending on the average wind speed in the area, a wind turbine rated in the range of 5 to 15 kilowatts (kW) would be required to make a significant contribution to this demand. A 1.5- kW wind turbine will meet the needs of a home requiring 300 kWh per month in a location with a 14-mile-per-hour (6.26-meters-persecond) annual average wind speed. The manufacturer can provide you with the expected annual energy output of the turbine as a function of annual average wind speed. The manufacturer will also provide information on the maximum wind speed at which the turbine is designed to operate safely. 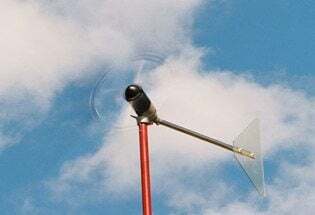 Most turbines have automatic overspeed-governing systems to keep the rotor from spinning out of control in very high winds. This information, along with your local wind speed and your energy budget, will help you decide which size turbine will best meet your electricity needs. what size turbie for wind plant i need? and depends on what? what size large scale turbie for wind plant i need? and depends on what?